Today TW and Plush CK are off to Blogpaws in Tyson Corner, Virginia. This year we're being joined by some special guests, Plush @BunnyJeanCook and @GeorgetheDuck! Doesn't that sound pawsome? When we went 2 years ago, we looked forward to meeting all our Twitter furrends for the first time. Sure, TW had talked with some of the them on the phone and in email, but this would be up close, personal and fun. This year, in addition to seeing those friends once again, we look forward to meeting many of our friends on the CB, who we didn't know 2 years ago. We're excited to note that they'll be representatives of Brian's Home, the Island Cats, Glogirly, Savannah Paw Tracks and Animal Shelter Volunteer Life, just to name a few. The gangs all here! Don't forget to look us up at Blogpaws! There are so many exciting seminars, we're still not sure which ones I'll be sending TW to. I'm instructing TW to pick up lots of free swag for me and maybe some stuff we can donate to A Call 4 Paws. Unfortunately for me, even though TW can schedule my blogs in advance (although this is the only one she scheduled), she can't comment from the conference unless she opts to stay up all night every night. As we always do, we'll be reading and saving our comments until TW is safely back home. She was supposed to teach Pop how to do updates but, of course, she didn't. I may try to get him to comment for me so if you see any comments from me that aren't in "my voice," that's why. We thank Prudence aka @Tildatoo for allowing her Mom to drive TW down and share a hotel suite with all of us on Team CK. 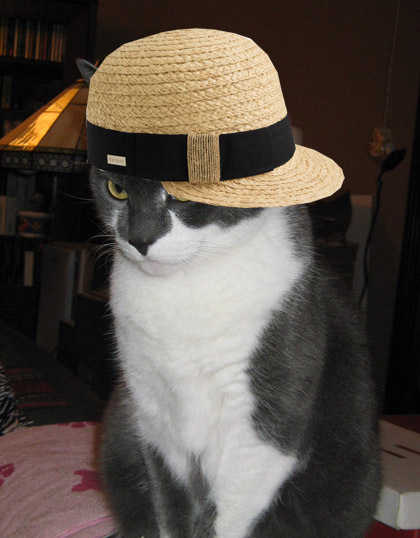 Because today is Straw Hat day across the CB, I thought I'd pose for you. Pricilla is very jealous. She really wanted to go. Glogirly is keeping watch if Pricilla's blog should win! Very gangsta! MOL! Tell Mom to have a great time and safe travels. See you when she gets back. Pee Ess - message us if you're up for a house trashin! A Gangsta straw hat! Superb. Please tell TW to have a really great time at Blogpaws. My humans used to live in McLean VA when Tyson's Corner was an infant shopping mall and nothing else there! The head peep really wanted to go, but it wasn't in the cards this year. We hope TW has a fabulous time and brings you great swag from Blogpaws, CK! Our Dad will be getting there Thursday evening and can't wait to meet the plush CK!!! I can't wait to see TW!! It's so exciting TW and Plush CK get to meet all the friends! I hope they will have lots of fun! I will tell you CK, I would love to meet and hug and kiss a gangsta like YOO! You are adorable. Oh snap! CK, you're looking tight in that straw hat! My dad (meowmeowmans) and mom are totally looking forward to meeting TW and Plush CK at BlogPaws. We hope TW has a great time at blog paws. Our Mama can't go, so she feels very down-tailed about it. CK your hat is BANGIN'! Now you need a big ole English "D" on it ... hee hee! CK,the mom says she can't wait to meet TW! She won't be there until tomorrow. We hope she doesn't miss out on any good swag. Hehe... great hat. 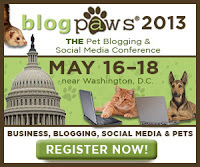 Have a pawsome time at Blog Paws, I wish I was going to meet this awesome group of bloggers. Happy WW! Hi Darling & Happy Caturday! I guess your naughty Human must still be off gallivanting instead of staying at home caring for YOUR needs--course, you do got Pops...it would be nice to have a spare Human, I think. Fank you for your nice comments and purrs this last week--I am better, MUCH better, now and the Human is so relieved she is obeying my every command, as it should be all the time! Have a great time at Blogpaws. I wish I could be there. Digging the straw hat gangster look. Seriously, CK! You the ONLY kitteh we know who can make a straw hat go gangsta! Totally RAD!